This 100% pure poppy seed collection blooms throughout the spring and summer. The California Poppy seed blankets California's natural landscape with glorious gold, red, orange, and yellow brilliance. Fortunately for non-Californians, it grows easily just about everywhere in America. Yes, California Poppy seeds are annuals, but they re-seed prolifically year after year. 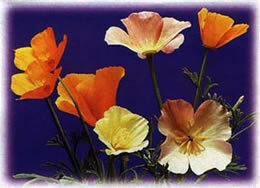 The California Poppy Seed Collection produces a variety of gold, red, orange, and yellow hued poppies. Likes full sun in light to sandy type soils. Sow in late fall or early spring, depending on your zone. Blooms uniformly throughout the spring and summer. This mix features 8 varieties 6-12" tall.